The moveit package must be run on a remote computer and not directly on your robot. romeo_moveit_config package doesn\'t need any compilation, so running rospack profile should be enough. For the dcm packages you need to compile the C++ nodes. In order to compile romeo_dcm packages, you need to set the environment variable AL_DIR to the path to NAOqiSDK-c++ on your computer. Wait until it is ready, then click on the Play button in Gazebo. RVIZ has been open: you can see that a MotionPlanning plugin has been launched. First check the box \"Allow approximate IK Solutions\" on the bottom of the left control panel. Then, go to the Planning tab. 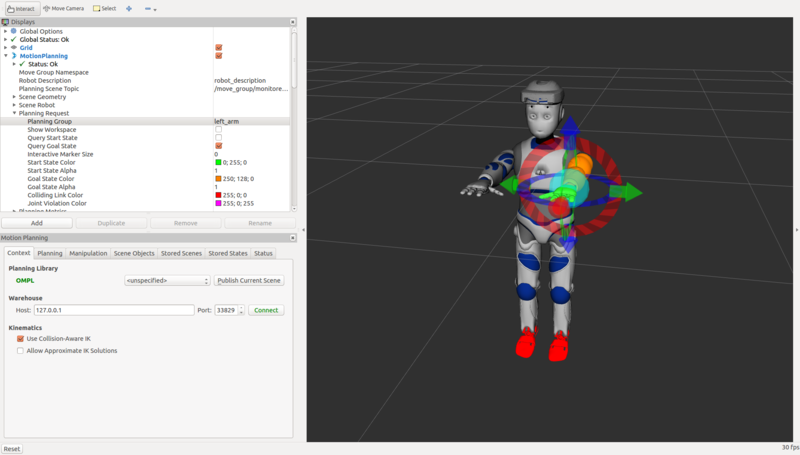 Now you can define your motion by drag and dropping the interactive markers. You can compute a trajectory by clicking the \'planning\' button Once the motion is satisfying you can try it on your real robot using \'execute\' or \'plan and execute\'. NOTE: The start state is not updated automatically, you have to go to \'Select Start State\' select \'Current\' and click \'Update\'.